Ok, so this thing’s obviously in need of some connecting routes, but that’s nothing a canal here and a portage there couldn’t fix. 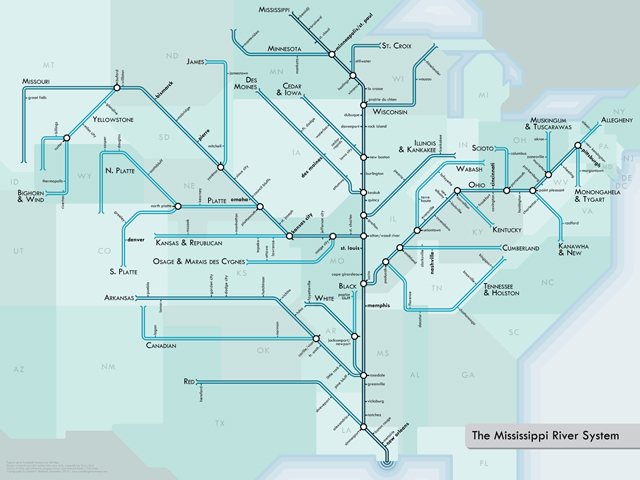 I’d also extend a branch out to Chicago, which is a natural transfer point to the Great Lakes system. But it’s pretty awesome, and captures in full the river’s unique Flying Spaghetti Monster qualities. Huffman, who put together the map of Twitter profanity that won the Internet last month, also mapped a few more river systems, which you can check out here. What if Western States Were Organized by Water?